If you look at a short list of the most successful film franchises, clearly the Star Wars series deserves a high placement. Indeed, one could argue that it’s the most popular of all the various possibilities. I know others like the Harry Potter series made more money, but I think in terms of overall success and influence, it’d be hard to beat the Star Wars franchise. For the first time ever, fans can get all six films in one place. 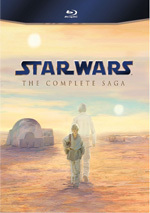 “Star Wars: The Complete Saga” packages the three “Original Trilogy” movies with the three from the “Prequel Trilogy” and adds a mix of new supplements. For full information on the individual movies, please consult my separate reviews of 1977’s Star Wars, 1980’s The Empire Strikes Back, 1983’s Return of the Jedi, 1999’s The Phantom Menace, 2002’s Attack of the Clones and 2005’s Revenge of the Sith. Please note that the picture and sound grades found at the top of this article represent an average for the three movies. Please check out the full reviews to get the details. Though this article covers the boxed set as a whole, I want to concentrate mainly on the package’s seventh through ninth discs. These contain a wealth of information. Discs Seven and Eight break into four basic categories: “Interviews”, “Deleted/Extended Scenes”, “The Collection” and “Concept Art Gallery”. Disc Seven delivers info about the three prequels, while Disc Eight goes over the original trilogy. Each film gets three or four separate domains, both named after locations from the series. Why? I don’t know, but that’s how it is! I’ll ignore the splits and just examine the materials for each movie without separation. We find 22 minutes, nine seconds of Interviews here. In these, we hear from writer/director/producer George Lucas, producer Rick McCallum, visual effects supervisor Dennis Muren, design director Doug Chiang, visual effects supervisor John Knoll, and actor Liam Neeson. They discuss effects, visual design, relaunching the Star Wars franchise, characters and story, locations, and some other elements. Much of this material appeared in the various commentaries, but we still get some good insights here. I especially like McCallum’s discussion of what he saw when he returned to Tunisia. Five Deleted/Extended Scenes fill a total of four minutes, two seconds. We see “Trash-Talking Droids” (0:36), “The Battle Is Over” (0:29), “Anakin’s Return” (0:26), “Battle on the Boarding Ramp” (0:28), “Extended Podrace Wager” (1:35) and “Bail Organa of Alderaan” (0:28). As you can tell, none of these clips runs very long, so we don’t get a lot from them. “Organa” is an interesting novelty because it shows a different actor in the role eventually played by Jimmy Smits. None of the scenes adds much, but they’re fun to see. Note that these scenes – and most of the remaining ones on the disc – come in varying stages of completion. Those that would involve heavy effects – like battle sequences – look the most incomplete. Sometimes we see actors fighting against nothing, and others offer simple CG representations of the material. I remain happy to see the various scenes – it actually gives me more respect for the actors’ talent when you witness how ridiculous they look swinging lightsabers at non-existent foes – but I wanted to mention that many of the scenes lack formal polish. The Collection lets us look closer at visual elements. It gives us “360 Turnarounds” of models, maquettes and costumes and also delivers “video commentaries” about the subjects. We find “Jar Jar Maquette”, “Trade Federation Battleship Concept Model”, “Republic Cruiser Concept Model”, “Queen Amidala Throne Room Costume”, “Full Sized Battle Droid”, “Naboo Starfighter Concept Model”, a “Sando Aqua Monster Maquette”, “Darth Maul Costume”, “Palpatine’s Shuttle Model”, “Queen’s Royal Starship Concept Model”, “Eopie with Anakin Maquette”, “Watto Maquette”, “Sebulba Maquette”, “Dud Bolt Puppet”, “Anakin’s Podracer ‘Tabletop’ Model”, “Sith Speeder Model”, “Coruscant Air Taxi Model”, “Queen Amidala Senate Costume”, “Queen Amidala Pre-Senate Address Costume”, and “Senate Guard Costume”. We can explore these in a variety of ways. The “360 Turnarounds” film the objects in the expected circular manner to show them from all sides, and we can also get closer “Detail” photos. I’m not wild about the “turnarounds”, but the detailed pictures can be interesting. I most enjoyed the “Video Commentaries”. These deliver short featurettes about the different elements. For Menace, they run 36 minutes, 11 seconds and feature notes from Doug Chiang, concept artist Terryl Whitlatch, concept model makers John Duncan and John Goodson, model supervisor Steve Gawley, special effects supervisor Geoff Heron, costume designer Trisha Biggar, concept sculptors Richard Miller and Marc Siegel, model maker Danny Wagner, and costume assistant Gillian Libbert. Throughout these, we learn a lot about the various elements. The participants delve into influences/inspirations for the different items and also chat about how the designs were executed. The format’s a bit awkward – I would’ve liked a simple option to play all of the “video commentaries” and skip the rest – but we get enough good information to make the commentaries worth the effort. We also find Concept Art Galleries. For Menace, this shows 78 images that look at characters such as Darth Maul and Jar Jar Binks, costumes and vehicles. The amount of material seems a bit skimpy – in the vast world of Menace, they can only dig up 78 sketches? – but the quality of the elements is good. Under “Naboo”, we also find an Archive Fly-Through. This runs three minutes, 40 seconds as it zooms around Skywalker Ranch and into that location’s treasure trove of models, costumes and other Star Wars memorabilia. This covers all six movies, and it’s a fun take on a place most people will never be able to visit. We launch with more Interviews. These run a total of 17 minutes, 19 seconds and feature Chiang, Knoll, visual effects supervisor Ben Snow, and actors Ewan McGregor, Hayden Christensen, Christopher Lee, Samuel L.Jackson and Natalie Portman. This set of interviews covers locations, sets and visual design, various effects, stunts and action, and acting in front of a blue screen. Plenty of good notes appear here, with the actors’ remarks about blue screen performances the most interesting of all. Five Deleted/Extended Scenes last a total of eight minutes, 18 seconds. This domain offers “Extended Speeder Chase” (1:10), “The Lost Twenty” (1:05), “Anakin’s Nightmares” (1:07), “Anakin and Ruwee” (0:54), and “Raid on the Droid Control Ship and Extended Arena Fight” (4:02). Of these, “Twenty” and “Ruwee” are the most intriguing. “Ruwee” lets us meet Padme’s father, and “Twenty” delivers a bit more exposition about Count Dooku. Neither needed to be in the final cut, but they’re interesting; the others are enjoyable as well, even if the fights look silly due to the lack of finished effects. More materials appear for this film’s Collection. In this case, we examine “Dexter Jettster Maquette”, “Zam Wesell Speeder Concept Model”, “Youngling Outfit and Helmet Costume”, “Zam Wesell Costume”, “Shaak Maquette”, “Anakin Outland Peasant Costume (With Cloak)”, “Anakin Outland Peasant Costume (Without Cloak)”, “Padme Outland Peasant Costume (With Cloak)”, “Padme Outland Peasant Costume (Without Cloak)”, “C-3PO Costume”, “Tusken Raider Woman Costume”, “Tusken Raider Child Costume”, “Geonosian Maquette”, “Ackklay Maquette”, “Nexu Maquette”, “Reek Maquette”, “Padme Trip to Geonosis Costume (with Unusued Headdress)”, “Jango Fett Costume”, “Super Battle Droid Maquette”, “Geonosis Arena Maquette”, “Republic Gunship Model”, and “Clone Trooper Maquette”. All together, this batch of “Video Commentaries” fills a total of 32 minutes, 59 seconds. The commentaries feature John Duncan, Trisha Biggar, Mark Siegel, Gillian Libbert, Doug Chiang, Danny Wagner, John Knoll, concept sculptors Robert Barnes and Mike Murnane, and droid unit supervisor Don Bies. Another set of Concept Art Galleries comes next. In this area, we check out 80 elements that show the same array of characters, costumes and vehicles witnessed in the Menace galleries. Again, we get too few for my liking, but I think the quality of what we find is top-notch. For Sith’s Interviews, we get a total of 25 minutes, eight seconds worth of footage. We find remarks from John Knoll, Samuel L. Jackson, Natalie Portman, concept design supervisor Ryan Church, practical model supervisor Brian Gernand, and visual effects supervisor Roger Guyett. These cover visual design and sets, cameos, various effects, stunts and action, characters, and some discarded ideas. Again, the pieces are enjoyable, especially when we hear about altered/unutilized set ideas and Steven Spielberg’s involvement in the film. 11 Deleted Extended Scenes occupy a total of 37 minutes, seven seconds. We locate “Elevator Antics” (1:39), “Escape Through the Hangar” (2:39), “Changes to the Constitution” (2:04), “Utapau Chase Animatics” (8:34), “Mustafar Duel Animatics” (3:37), “Mustafar Duel/Lava River Animatics” (3:49), “Kashyyyk Attack and Order 66 Animatic” (6:47), “Anakin Kills Shaak Ti” (0:37), “Jedi Imposters at the Temple” (0:47), “Senate Duel Animatic” (5:34) and “Yoda Communes with Qui-Gon” (1:00). With the most ample collection of cut sequences from any of the three prequels, we find plenty of interesting material here. Little of it seems revelatory, though “Communes” comes close to that level. The rest tends to concentrate on unused fight sequences, and those are all quite fun. One even boasts design work from Steven Spielberg. I suspect that these weren’t explored because they would’ve made the movie too long – it’d push three hours with all this footage – but they’re still a delight to see. With that we head to Sith’s Collection. It delivers examinations of “Separatist Cruiser Concept Model”, “ARC-170 Starfighter Concept Model”, “Jedi Starfighter Concept Model”, “Count Dooku Lightsaber”, “Palpatine Gray Trade Federation Costume”, “Anakin Costume and Headset”, “Boga with Obi-wan Maquette”, “Utapau Sinkhole Maquette”, “Utapau Landing Platform Maquette”, “General Grievous Maquette”, “Tion Medon Costume”, “Obi-wan Lightsaber”, “Anakin Lightsaber”, “Mustafar Landscape Maquette”, “Burnt Anakin Head”, “Wookiee Tree Maquette”, “Felucia Maquettes”, “Chewbacca Costume”, “Darth Vader Costume”, “Imperial Officer Costume (With Coat)”, and “Imperial Officer Costume (Without Coat)”. This area’s “Video Commentaries” go for a total of 29 minutes, 26 seconds. Across these, we find notes from John Goodson, Robert Barnes, Danny Barnes, Trisha Biggars, Don Bies, Brian Gernand, Richard Miller, Gillian Libbert, creatures supervisor Dave Elsey, and costume props supervisor Ivo Coveney. Once again, these offer a great take on the design and creation of the various ships, props and costumes. They’re a delight to see. Disc Seven finishes with more Concept Art Galleries. For Sith, we find 77 images of aliens, characters, ships and costumes. I still don’t think we get enough material, but I also still feel the quality remains good. A different trilogy awaits us, but the supplements follow the same framework. This means more Interviews. For Star Wars, we get clips that add up to 19 minutes, 59 seconds. We hear from production illustrator Ralph McQuarrie, 2nd cameraman Dennis Muren, special effects and sound designer Ben Burtt, and actors Mark Hamill, Anthony Daniels, and Carrie Fisher. The clips focus on visual and sound design, locations and sets, characters and performances, effects, and some general anecdotes. As usual, the interviews focus on the technical elements; the actors provide alternate views, but most of the footage stays with Muren and Burtt. They’re interesting but they don’t deliver a lot of information we didn’t get through the commentaries. Heck, some of Hamill’s remarks are the exact same ones found in the movie’s second commentary! These pieces are enjoyable, but they do tend to feel a bit redundant. Eight Deleted/Extended Scenes appear. These fill a total of 16 minutes, 22 seconds and include “Tosche Station” (5:21), “Old Woman on Tatooine” (0:24), “Aunt Beru’s Blue Milk” (0:31), “The Search for R2-D2” (0:43), “Cantina Rough Cut” (7:18), “Stormtrooper Search” (0:54), “Darth Vader Widens the Search” (0:35), and “Alternate Biggs and Luke Reunion” (0:36). Some of this material appeared on an old CD-ROM, but I don’t believe any of it’s been avaiilable on a more standard home video format. The scenes are a mixed bag. “Woman” and “Milk” are utterly forgettable, and “Stormtrooper” and “Vader” don’t add a lot more; they’re interesting as curiosities and that’s about it. “Reunion” is close to a scene found in the Special Edition version of Star Wars, but with one notable addition: a pilot’s reference to flying with Anakin Skywalker when he was younger. “Cantina” is fun, though. It doesn’t provide a lot of new footage, as much of it appears in the final cut. However, we see Han before his “real” introduction – and in the company of a babe! – plus other exotic creatures. It’s also amusing to hear the original actors’ voices for some of the small roles like the bartender; these were later dubbed with other performers. Greedo’s a lot less interesting when we hear some dude with a proper British accent read the lines in English. Without question, “Tosche” is the most famous and interesting of the cut sequences. It shows Luke as he watched the space battle that opens the movie; it then follows him to town where he hangs out with friends and chats with Biggs. I understand why Lucas cut the scene, but it’s still fascinating to see what would’ve been Luke’s introduction in the film. Within The Collection, we look more closely at “Landspeeder Prototype Model”, “Millennium Falcon Prototype Model”, “R2-D2”, “Tatooine from Orbit Matte Painting”, “Jawa Costume”, “Tusken Raider Mask”, “Ketwol Mask”, “Death Star Prototype Model”, “Holo-chess Set”, “Bridge Power Trench Matte Painting”, “Luke’s Stormtrooper Torso”, “X-Wing Fighter Model (Prototype)”, “X-Wing Fighter Model (Final)”, “Y-Wing Fighter Model (Prototype)”, “Y-Wing Fighter Model (Final)”, “TIE Fighter Model (Prototype)”, “TIE Fighter Model (Final)”, “Darth Vader’s TIE Fighter Model”, “X-Wing Pilot Costume with Helmet”, “Death Star Laser Tower Model”, and “Yavin 4 Matte Painting”. Across these, we hear from George Lucas, Ben Burtt, model makers Lorne Peterson, Paul Huston and Steve Gawley, droid unit supervisor Don Bies, concept artist Terryl Whitlach, stop motion animator Phil Tippett, and actor Ewan McGregor. The interview pieces fill a total of 21 minutes, 10 seconds. The “Collection” may be onto a different trilogy now, but the execution remains the same. We see many great shots of art, vehicles, creatures and costumes as the participants throw in plenty of good notes. The interface is still a bit annoying, but I’m happy with all the material. Inside the film’s Concept Art Galleries, we find 71 pieces. These echo the sorts of materials seen for the Prequel Trilogy, as we get elements that show vehicles, characters, costumes, props and creatures. As before, I still think we don’t get enough of these – the Lucasfilm archives must include thousands of pieces – but what we locate satisfies. The Star Wars area repeats the same Archive Fly-Through found on Disc Seven. Under Interviews, we find 26 minutes, six seconds of footage. These pieces feature info from George Lucas, Dennis Muren (now effects director of photography), model maker Charlie Bailey, director Irvin Kershner, production designer Norman Reynolds, and actor Frank Oz. We look at effects and photography, sets, editing, cast and performances, working the Yoda puppet, and ruminations on the Force. As expected, much of the material focuses on technical areas again, but that doesn’t make it unenjoyable. I especially like Lucas’s chat about editing – and the animatics that accompany his comments. 10 Deleted/Extended Scenes go for a total of 14 minutes, 54 seconds. We see “Han and Leia: Extended Echo Base Argument” (1:43), “Luke’s Recovery” (1:16), “Luke and Leia: Medical Center” (2:15), “Deleted Wampa Scenes” (2:43), “The Fate of General Veers” (0:31), “Yoda’s Test” (1:21), “Hiding in the Asteroid” (1:06), “Alternate Han and Leia Kiss” (1:59), “Lobot’s Capture” (0:57), and “Leia Tends to Luke” (1:03). “Argument” is fun, as it shows more bickering between Han and Leia, but it works so well in the final cut that the extensions would’ve hurt it. “Recovery” shows a little more of Luke after the Wampa fight; it’s also interesting for fans to see, but not anything especially valuable. “Center” taunts us with the potential Luke/Leia romantic relationship; it also shows Leia’s reaction to Luke’s imminent departure for Dagobah. It’s a good scene and one that could’ve worked in the final cut. Hinted at in “Center”, “Wampa” shows that those creatures created havoc at the Rebel base. It’s an exciting idea in theory, but as seen here, the clips aren’t very good. Unless the filmmakers could’ve fixed the problems in post, the Wampa plot would’ve flopped. “Veers” makes a death scene more obvious; it’s not especially interesting. “Test” develops the differences between Luke and his mentor a little more but doesn’t show anything that would’ve added to the dynamic. “Asteroid” just delivers a small addition to that sequence; it also fails to provide much of interest. “Kiss” lets Han and Leia smooch a little longer before 3PO interrupts. It’s decent but also nothing special. We lose track of Lobot in the final film; while not a substantial scene, “Capture” at least shows what happened to him. Finally, “Tends” adds some end-of-movie exposition. It’s a bit clumsy and feels like it just exists to set up the next movie. It also tells us what we already know. Inside The Collection, we inspect “AT-AT Walker Fallen Model”, “Snowspeeder Model”, “Tauntaun Maquette”, “Rebel Transport Model”, “Hoth Landscape Matte Painting”, “Leia Hoth Costume”, “Han Solo Interior Hoth Costume”, “Yoda Model”, “Luke’s Severed Head”, “Dagobah Bog Matte Painting”, “Dagobah Matte Painting”, “Luke’s Tan Costume”, “Star Destroyer Model”, “Millennium Falcon Model”, “Space Slug”, “Darth Vader’s Star Destroyer Model”, “Star Destroyer Hull Model”, “Executor Bridge Matte Painting”, “Boba Fett Prototype Costume”, “Imperial Officer Costume”, “Rebel Cruiser Model”, “Twin-Pod Cloud Car Model”, “Cloud City Models”, “Cloud City Matte Painting”, “Cloud City Landing Platform Matte Painting”, “Cloud City Core Vane Matte Painting”, “Cloud City Vane Platform Matte Painting”, “Lando Bespin Costume”, and “Cloud City Slave I Matte Painting”. The interview snippets run a total of 22 minutes, six seconds. In those, we get notes from Phil Tippett, Paul Huston, George Lucas, Lorne Peterson, Steve Gawley, effects director of photography Dennis Muren, model maker Charlie Bailey, director Irvin Kershner, and makeup and special creature designer Stuart Freeborn. Should you expect anything different from this “Collection”? Nope – it’s the same nice compilation of materials and information. By the way, inside this “Collection” you’ll find an excerpt from the infamous 1978 Star Wars Holiday Special. We see the nine-minute cartoon that introduced Boba Fett to the world. It’s an awful clip, but it’s cool to see for archival purposes. Maybe this means a thawing in Lucas’s hatred for that program and we’ll someday get an official release of the atrocity. As expected, our discussion of Empire concludes with Concept Art Galleries. In these, we find an additional 82 pieces of art. These follow the same well-established pattern and continue to be fun to examine. The final set of Interviews occupies a total of 14 minutes, 44 minutes. In these, we get notes from Dennis Muren, stop motion animator/makeup and creature designer Phil Tippett, model maker Bill George and actor Harrison Ford. These bits look at sets and locations, creatures and character design, more effects, and reflections on Lucas. We know what to expect from these interviews at this point. Once again, they’re pretty good – not great, but enjoyable. Deleted/Extended Scenes fill up 19 minutes, 35 seconds. We locate “Vader’s Arrival and Reaching Out to Luke” (2:50), “Tatooine Sandstorm” (2:15), “Rebel Raid on the Bunker” (2:22), “Jerjerrod’s Conflict” (2:28), and “Battle of Endor: The Lost Rebels” (9:40). “Arrival” lets us see Luke and the droids before their introductions in the final film. It’s vaguely interesting to see more of the psychic connection between Luke and Vader, but I prefer the way things play in the end cut. “Sandstorm” shows our heroes as they leave Tatooine after Han’s rescue from Jabba. Like many of these scenes, it’s cool for fans to see, but it’s not something that would’ve been good in the movie; it’s slow and doesn’t tell us anything new. “Raid” gives us more of the Solo-led assault on Endor. It’s not as exciting as it sounds, though we do get Solo’s incredulous reaction to being called “Rebel scum”. With “Conflict”, we see the concerns of an Imperial officer: the Emperor tells him to blow up Endor if the troops lose, but he’s not eager to sacrifice surviving soldiers. It’s not something that should’ve made the final cut, as it’s pretty irrelevant story-wise, but it’s intriguing to see an Imperial officer who shows a more human side. Finally, “Battle” really offers outtakes more than a deleted scene. It first shows the same fighter sequence performed by a mix of characters and actors. This includes two female pilots, a Sullustan and a Mon Calamari as they repeat lines fed to them from off-screen. We then get silent footage of anonymous rebels as they set up the Endor assault and fly fighter ships before we end with an alternate version of command sequences that feature General Madine instead of Admiral Ackbar; these were shot incase the filmmakers decided the Ackbar puppet wasn’t realistic enough. All of this qualifies as fun for fans but not particularly stimulating otherwise. When we head to The Collection, we check out “Rancor Maquette”, “EV-9D9”, “Salacious B. Crumb”, “C-3PO’s Head with Eye Poked Out”, “Jabba’s Palace, Road Creature Matte Painting”, “Sarlacc Pit Matte Painting”, “Leia’s Boushh Costume”, “Slave Leia Costume”, “Lando Skiff Guard Costume”, “Jabba’s Radio-Controlled Eyes”, “AT-ST Walker Model”, “Speeder Bike”, “Imperial Shuttle Model”, “Ewok Hang Glider Maquette”, “Imperial Shuttle Landing Matte Painting”, “Endor Landing Platform Matte Painting”, “Ewok Costume”, “Biker Scout Costume”, “B-Wing Fighter Model”, “TIE Interceptor Model”, “Death Star Under Construction Model”, “Imperial Shuttle Bay Matte Painting”, “Admiral Ackbar Costume”, “Death Star Equator Docking Bay Matte Painting”, and “Millennium Falcon in Docking Bay Matte Painting”. The different interviews run a total of 16 minutes, 32 seconds. We hear from Phil Tippett, Dennis Muren, jeweler Richard Miller, and model maker Bill George. This is another pretty good section, though it’s obviously the shortest of the bunch. I have to state that it’s a disappointment the Original Trilogy interviews barely touched on costumes, too; we see a lot of them but don’t hear much about them. Still, we get some more good notes in this compilation, so my disappointment remains relative. With that we head to our final set of Concept Art Galleries. These deliver another 75 images and are as interesting as all their predecessors. For the final platter of extras, we get a slew of video features, most of which appear in the “Documentaries” domain. A vintage late-1970s piece, The Making of Star Wars runs 49 minutes, one second and presents comments from George Lucas, Harrison Ford, Carrie Fisher, Alec Guinness, Gary Kurtz and Mark Hamill. The show looks at the movie’s inspirations, influences and development, characters and story, sets and locations, cast and performances, various effects, and a few other production areas. I don’t expect much from period shows like this, but “Making” is actually pretty good. It benefits from a lot of behind the scenes footage, and it’s less fluffy/glossy than anticipated. It delivers surprisingly strong information and is enjoyable as well. Narrated by Mark Hamill, The Empire Strikes Back: SPFX goes for 48-minutes, five-seconds and offers material from Peter Mayhew and Ben Burtt. Don’t expect much in that vein, as Hamill’s narration dominates this look at Empire. Though it mostly concentrates on visual effects, it also gets into music, audio and stunts. As with “Making of Star Wars, “SPFX” works best when it shows behind the scenes footage, of which we find ample material. Those elements help make “SPSX” interesting and enjoyable, though it’s not as much fun as “Making”. It lacks the same level of information and spends too much time with views of other films. It’s still good, though, and it deserves a look. Another vintage piece arrives with Classic Creatures: Return of the Jedi. With alternating narration from Carrie Fisher and Billy Dee Williams, it fills 48 minutes, seven seconds and includes statements from George Lucas, Phil Tippett, and Muppet master Jim Henson. This documentary goes for an even more specific focus than “SPFX” as it sticks entirely with a discussion of the movie’s unusual lifeforms. We learn about the design and creation of Ewoks, the Rancor monster, Admiral Ackbar, Salacious Crumb, Sy Snootles, and Jabba the Hutt, among others. Expect “Creatures” to resemble “SPFX”, though I think it works better. We get a broader perspective and better footage from the production. Heck, we even find a goofy skit in which Chewbacca and some others take a Pan Am (!) flight to London! “Making of Star Wars remains the best of these period documentaries, but “Creatures” offers plenty of value as well. Anatomy of a Dewback lasts 26 minutes, 17 seconds and features George Lucas, Terryl Whitlach, visual effects editor David Tanaka, visual effects producer Tom Kennedy, computer graphics artist Howard Gersh, film editor TM Christopher, Lucasfilm film archivist Tim Fox, film restoration consultants Leon Briggs and Pete Comandini, visual effects supervisor Alex Seiden, Fox Studios post-production executive Ted Gagliano, animatics artist David Dozoretz, and Lucasfilm creature and model archivist Nelson Hall. “Anatomy” looks at the work done to update the 1997 Star Wars Special Edition to include extra dewbacks. It’s easily the most technical of the programs so far on Disc Nine, and it can be a bit dry. Nonetheless, it delivers a good take on the work that went into the 1997 version. Next comes the one-hour, 24-minute Star Warriors. It examines the 501st Legion, a world-wide fan group that focuses on the creation and use of accurate movie-related costumes. Lucasfilm needed a few hundred stormtroopers to march in the Rose Parade, so they dug through 501st Legion volunteers; we get to know some of these folks, follow the selection process and view the results. There’s a nice way to look at such dedicated fans, and there’s a nasty way. Since “Star Warriors” appears on an official Star Wars release, you’ll probably guess that it goes the first path. Sure, it shows that the members of the Legion tend to be pretty nerdy, but it lets us view them as real people and depicts the positive actions of the 501st. “Warriors” is probably too long for this kind of piece, and it loses a lot of steam when it gets the participants to California for the Rose Parade. While it was fun to get to see the fans in real life, the preparations for the event become tedious. That makes “Warriors” a bit of a chore to finish, but it’s interesting to get a better look at these diehard partisans and worthwhile for its first half or so. After this we get Star Wars Tech. It goes for 45 minutes, 36 seconds and delivers info from John Goodson, Rob Coleman, Lorne Peterson, scientist/author Jeanne Cavelos, NASA Jet Propulsion Laboratory Deep Space 1 project manager Marc Rayman, UC-Irvine Associate Professor of Physics Michael Dennin, NASA Jet Propulsion Laboratory Terrestrial Planet Finder Project physicist Kurt Liewer, NASA Jet Propulsion Laboratory propulsion engineer Todd Barber, UC-Irvine Professor of Anatomy and Neurobiology James H. Fallon, human robotics engineer Jay Martin, UC-Irvine Laser Spectroscopy Facility director Wytze van der Veer, and MIT Media Lab Robotic Life Group director Cynthia Breazeal. The program looks at the real-life science connected to the fantasy of the Star Wars universe. This offers a fun glimpse of technology. The show discusses a mix of different areas as it lets us know what’s semi-realistic based on our current science and what’s far-fetched. It’s an interesting take on an intriguing topic. Finally, A Conversation with the Masters (ESB 30 Years Later) runs 25 minutes, 11 seconds and offers details from Irvin Kershner, George Lucas, screenwriter Lawrence Kasdan, and composer John Williams. “Conversation” looks at story/character issues as well as music and reactions to the movie. We hear some similar material during the Empire commentaries, but that doesn’t make this piece a waste of time. It’s still informative and enjoyable, even if it’s not always the most fresh show. Disc Nine finishes with one hour, 37 minutes and 32 seconds of Star Wars Spoofs. These come from a broad array of sources, but oddly, the disc doesn’t index them – or even give each one its own chapter stop. That makes it awfully awkward to navigate the collection. The “Spoofs” come from a wide variety of sources, though some recur. We get a smattering of samples from Saturday Night Live, Robot Chicken, That 70s Shows, Late Night with Conan O’Brien, The Simpsons, and Family Guy. Plenty of other pieces pop up – too many to list individually, but look for some music videos as well as web videos and clips from various movies and TV shows. The majority of the pieces come from creations over the last 20 years. I suspect the oldest clips come from SNL- via Bill Murray’s lounge singer’s take on the Star Wars theme – as well as Candid Camera and an awful (but perversely amusing) Donny and Marie skit. I don’t think we find much from the 80s; I recall a Muppet Show bit with an Empire-era Mark Hamill and a clip from Spaceballs but can’t remember any other 80s material. Matters get much more active in the 90s and 2000s, though, so expect lots of that work. Also expect a tremendously mixed bag. For every funny bit, you’ll find one or two relative duds, so there’s little consistency on display. That’s not a surprise, though, and we do find a decent array of clips. This is certainly an unusual addition to the set, and it’s a fairly welcome one. Fans who owned the six Star Wars movies on DVD may wonder what happened to all those extras. The answer? Ask George. As far as I can tell, the audio commentaries repeat from the DVDs but everything else goes MIA here. I’d guess that Lucas and company would try to convince us that this is a good thing, as we get totally fresh material for our money. That’s correct – from a certain point of view. But I think it’s disingenuous. For those of us who own all the prior DVDs, I guess it’s nice that we don’t have to pay for material that we already own. On the other hand, given this set’s cost, I don’t think it would’ve been too much to ask for Lucas to toss in the previously released materials as well – and keep the package at the same MSRP. After all, it would cost them little to include the extra discs. Heck, just give us the same SD-DVDs from the old packages; while it’d be nice to get the earlier bonus materials in high-def, I’d rather have them SD than not at all. This arrangement also leaves people who don’t own the DVDs out in the cold. Now they need to go back and get those discs if they want a full set of supplements. It wouldn’t have taken much to make “The Complete Saga” truly complete, so the absence of the previously-released materials disappoints. That said, I don’t want to negate the overall high quality of this set. One can quibble with certain choices – many have and many will – but I feel pretty satisfied with “The Complete Saga”. 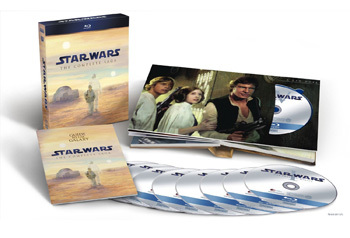 It packages all six Star Wars movies in one place for a reasonable price and makes them look and sound awfully good most of the time. Add to that a slew of interesting supplements and “The Complete Saga” is a winner. Is it perfect? No, but it’s a nice release, and I’m happy to own it.